Why should the junction on the left be kept clear? Why should the junction on the left be kept clear? Emerging is a skill which requires a lot of practice to be able to consistently judge the speed and distance of approaching vehicles. Gap selection is important: it shouldn’t cause other drivers to brake, swerve or hit you. Mirrors – check interior and wing mirrors. When turning right it’s important to also check the left mirror in case there’s a cyclist or motorcyclist that might try to filter around you on the left. Look – check for pedestrians, check for parked cars moving away, and keep an eye out for hard-to-see road users like cyclists and motorcyclists. How can you make emerging safer? Know how fast your vehicle accelerates and how it accelerates (some vehicles are slow off the line, and vehicles with turbo lag can be slow then suddenly experience a lot of power which can cause wheelspin. Be aware of how much grip the road has. If it’s wet, the white lines will be more slippery, as will manhole covers. Is there gravel? Are there any potholes you’ll need to avoid. The biggest danger is stalling when you are half way across the road. When is emerging more dangerous? Paradoxically it can be more dangerous to have a junction with good visibility because you will be tempted to not slow down as much before making the turn. When you are moving it’s more difficult to judge the speed and distance of approaching vehicles. You also have to be looking where you are going while trying to look both ways up the road. However, you do get some advantage in terms of being able to carry speed through the junction which means you can get up-to-speed more quickly. If you are turning left you don’t just have to worry about traffic from the right. There might be a vehicle overtaking that is approaching from your left, and if you turn into them you’ll have a head on collision. Motorcyclists and cyclists are much less visible in low light. They also tend to only have one source of light which makes it more difficult for you to judge their approach distance. Parked traffic can obscure your view up the road. Use other clues to help you see if vehicles are coming such as reflections, shadows and opening your window to see if you can hear anything coming. If you have to accelerate uphill you won’t be as fast as if you accelerate from a flat surface. There’s more likelihood of wheelspin, especially if it’s wet. Ever watched a large plane come in to land? It doesn’t look like it’s moving that fast even though it’ll be doing over 120mph. This is because the larger the object is, the slower it seems to be moving. A twenty-metre lorry travelling at 50mph takes almost a second to travel its own length whereas a family hatchback takes less than a quarter of a second. This means that when a large lorry is approaching you, your perception of its speed is that it is travelling slower than it really is, which means there’s more chance of you pulling out in front of it. Be careful if a driver flashes their lights at you. The true meaning of flashing lights is a warning you are there, not a permission for you to go, so it’s best to make eye contact with the driver and wave thanks just to be sure. 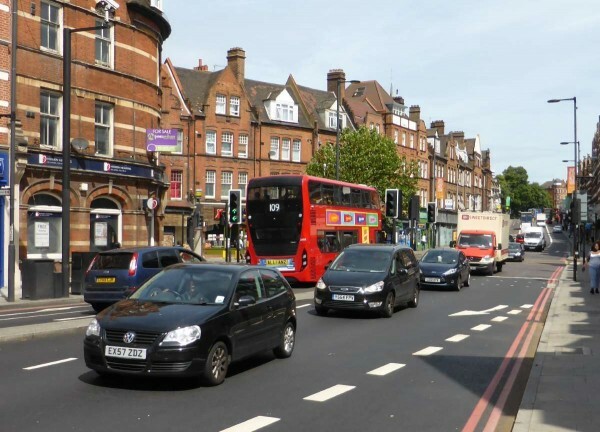 While you will still need to check both right and left when turning left out of a T-junction, it’s only the gap to traffic on the right that you need to be concerned with. A good guideline is to make sure that you have six seconds until the vehicle approaching would reach you. A left-hand bend is simple, but it’s also tighter than a right-hand bend and that means that you won’t be able to accelerate away as quickly. As long as you have checked that the way is clear and that there are no pedestrians crossing, and no parked cars blocking your route then six seconds should be sufficient in most vehicles. If you have a much faster car or motorbike, slightly less could be fine, but if you’re pulling a trailer or driving a slower lorry then you might need more than six seconds. Six seconds at 37mph is around 100m. When turning right you need to look for traffic from the left and the right. 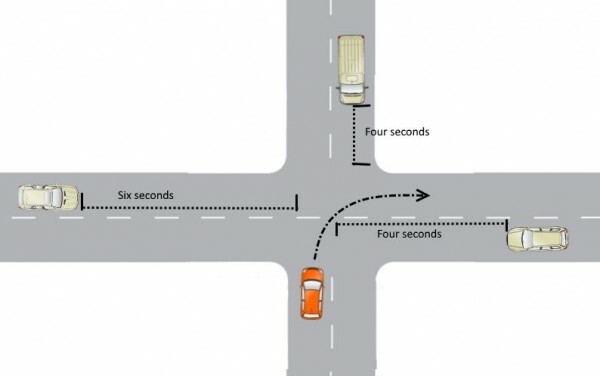 You won’t need as much time for traffic from the right because all you need to do is cross their lane, but you will still need six seconds for traffic from the left. Because the turn will be a greater circumference you will be able to accelerate slightly quicker. Adjust your curve based on the width of the road and how much time you think you have: if there are huge gaps in the traffic from the left but less so from the right make a more direct route across the road and a sharper turn right; conversely, if the gaps are larger from the right and less from the left, make a more shallow turn so that you can get up-to-speed more quickly. If you are driving a vehicle on the top of the T junction turning right, then your gap selection should be around three seconds. As per turning right out of a T-junction, traffic from the right and left needs the same amount of space. But you now need to deal with traffic from straight ahead, so allow four seconds if you are turning right as they will have the right of way if travelling straight ahead or turning left. If you are travelling straight ahead then you will need to leave three seconds’ gap to traffic on the right and four seconds for the left. In really heavy traffic, like rush hour, often you’ll rely on other drivers’ courtesy to be let into a gap. If you can’t turn right because traffic is too heavy, turn left then turn right and do a u-turn or three-point turn to get back to the road you wanted to be on. Step 1: Walk to a junction that has a lot of traffic turning out of it. Position yourself on the left corner so that you can see traffic coming from either way and you’ve got a similar view to the drivers emerging. See if you can judge when you would pull out of the junction in relation to when the drivers do. Notice how different vehicles and different drivers make different decisions. An articulated lorry waits for a much longer gap than a sports bike, for example. Step 2: Take a ride with an experienced driver to the same junction and have them turn out of it 5-10 times. See if you can anticipate when they’ll go. If you’re constantly before them then you will probably end up making rash decisions and choosing an unsafe gap. Step 3: With a driving instructor or experienced supervisor, go to the same junction and try it yourself. Step 4: Now try lots of other junctions. Build up your confidence with some easy junctions before moving onto harder ones.